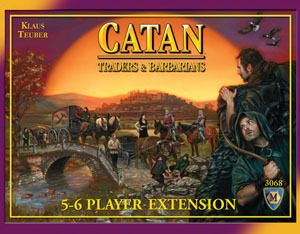 With this extension you can play all five exciting Catan: Traders & BarbarianT scenarios with up to six players. Now you'll face even more competition from your fellow settlers as you struggle to survive and prosper on the island of Catan! Like the other 5,6 player expansions this one is a must have. It tweaks the rules a little to speed up the game, but gives you the 2 more friends to play with. If you've become tired of the same old settlers games playing out the same way time after time, you owe it to yourself and your gaming group to pick up this expansion along with the Traders & Barbarians base. While I can't say that its my favorite expansion for Settlers, it does add interaction which is always good in my book. Definitely give this one a try if you already have the other expansions!